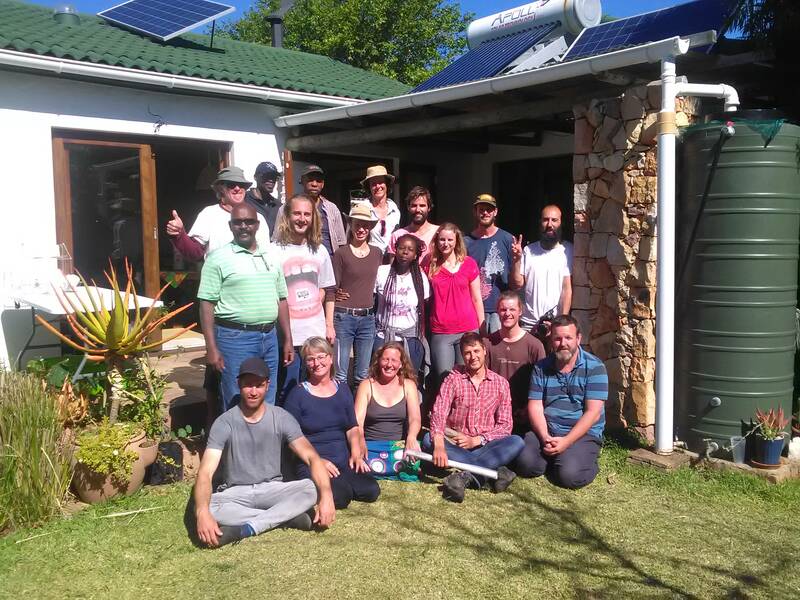 NEXT COURSE DATES: The next course will be run at Oudeberg Permaculture Farm outside Montagu from 14 to 26 October 2019. Why attend a Permaculture Course? Empower yourself and learn how to become self-sufficient in any situation. The Permaculture Design Course teaches essential skills to meet the challenges of a world beset with climate change, economic meltdown, and diminishing natural resources. Learn to design regenerative human living environments that will provide for your every need in a way that benefits everything and everyone around you… A Permaculture Design Course will change your life and set you on a pathway towards health, abundance, personal freedom and economic well-being without compromising the earth or your ethics. The Permaculture Design Course is the international standard for entry into the world of permaculture. Because Permaculture is a design system, having a working grasp of the design process is critical to successful application of permaculture in one’s life. The Permaculture Design Course specifically focuses on design by practically exploring the ethics, principles, and methodology that underpin permaculture design. The Permaculture Design Course was developed by Bill Mollison to teach principles and foundations of sustainable design. All PDC courses offered throughout the world must follow the same format to assure that the integrity of certification process is upheld. Permaculture Education Africa’s PDC follows the original certification course developed by Bill Mollison and David Holmgren plus includes layers of process and content that are appropriate to the African context. Our courses meet all the requirements for certification. Participants that attend all sessions of this class and complete the final design project will receive Certificate of Permaculture Design. Permaculture Education Africa’s courses are now been held in a variety of venues depending on the time of year. We are now holding one in Montagu each year in April. The Love Green Urban Permaculture site at Oudeberg Permaculture Farm is a unique set-up in the South African context, where genuine commercial scale Regenerative farming operations that a properly established permaculture systems can be counted on one hand. Please have a look at the pages on this website lovegreenpermaculture.co.za for details of the farm itself, which has been under transformation into a Regenerative farm since late 2014 and progress has been rapid and highly effective. There is still much to be done before all niches in the system are filled and the system reaches maturity but at this stage, it is a thriving and diverse system with a range of interesting elements and systems that can be transferred into any permaculture context. The site will be the base for the course and will provide all the training systems, examples and practical sites we require. Because it is a productive farm most of the food on the course will be produced from the systems and participants will have the unique opportunity to live in and interface with a broad range of ecosystemic production systems and infrastructures. The course will be a residential course, meaning all staff and students will be living together on the farm in our range of accommodation options, which will allow us to build a small ecological learning community for 2 weeks, giving everyone a sense of life in a permaculture system. All meals will be provided as it is a fully catered course, which will be vegetarian and organic. The menus are designed to use seasonal food, to keep energy levels high and people a healthy opportunity to live off conscious cooking by Conscious Food Master, Larissa Green. There is a range of accommodation options from comfortable cottage stay in restored earth buildings to tented camping, aimed to suit all budgets. The accommodation area is well integrated into close proximity to the hub of the farm and the training area, keeping everyone together in a community context. Please read further down the page for various options and pricing. The course is alcohol-free and all personal care items will be provided for as we do not allow any non-organic personal care products or alcohol onto the farm. See this as an opportunity to experience conscious living, a doorway into a post-consumer society. If people wish to go out and have a drink or a meal then Montagu is an easy 20-minute drive away, along a good road. We will be involved in practical design tasks as well as implementing a food forest on the course, with the farm providing a wide diversity of contexts to learn directly from. Permaculture is the conscious design of human living environments that are reflections of the ecological principle that underlies nature. It is the harmonious integration of landscape and people providing their food, energy, shelter and other material and non-material needs in a regenerative way. Permaculture design is a system of assembling conceptual, material, and strategic components in a pattern which functions to benefit life in all its forms. Without regenerative resource management, there is no possibility of a regenerative human culture. Regenerative human cultural and economic systems are built on the regenerative resource base which makes available renewable natural capital as the core and energy source for society. CARE OF THE EARTH: Look after our planet and everything that lives on it. CARE OF THE PEOPLE: Look after each other. SURPLUS SHARE: Direct all surplus resources, time, and energy towards establishing to first two ethics in the world around us so that is may transform into a healthy, abundant and peaceful place for all. PROMOTE LIFE: All forms of life have a right to exist. Our efforts as designers are directed towards enhancing and promoting life in all its wonderful and diverse forms. The core of permaculture has always been in supplying a design toolkit for human habitation. This toolkit helps the designer to model a final design based on an observation of how ecosystems interact combined with human needs and vision. This results in understanding the natural pattern of place into which a design pattern is harmonised. – Design of urban homesteads, farms (small or large-scale), community-based natural resource management systems, sustainable community development programs, village, and city design (Ecovillage and Ecocity), integrated business planning and design, the design of integrated and appropriate social and legal system. It is an ideal tool for regional and local planning for NGO and government workers in all fields of sustainable development. Development of integrated systems management and assessment tools to bring disparate and non-communicating elements of any environment together into organic processes that self-replicate and evolve. Discover how to turn problems into solutions and become a solutions-based thinker. Assess systems for regenerative potential. Develop business plans based on outputs from regenerative systems. The curriculum we follow is based on the internationally accepted structure that is based on Bill Mollison’s Designers Manual. This means we cover all the broad themes in permaculture and thus the content is appropriate for any student whether you live in the city or country or in any climate context around the world. The details of the curriculum are specifically tailor made for each course context, depending on student needs and requirements. Structure & processes of ecosystems, 4 Ecosystem Processes, Assessment of Ecosystems for effectiveness, Brittle & Non-Brittle Environments, Global Climate Patterns, Land Shape & Topography, Vegetation Biomes. Patterns in Nature, Fibonacci Sequence, Torus & Vortex Patterns, Dualism & its Integration, Scale & Order in Nature, Designing with Pattern Application. What is Holistic Management, Developing a Holistic Context, Holistic Decision Making Processes, Testing Questions. Keyline Scale of Permanence, Design by Analysis, Making Connections, Design by Random Association, Design by Land Units, Zones & Elements Placement, Mainframe Design Structure, Design Criteria for Landforms, Designing with Water, Land Use Mapping, Design Data Presentation. The Nature of Water, Design of Regenerative Water Infrastructures, Earthworks, The Nature of Soils, Design of Regenerative Soil Management Systems, Design of Buildings according to Climate, Off-Grid Technology Systems Design, Trees & Perennial Plants in Design, Design of Plant & Animal Based Production Systems according to Scale, Climate and Zones, Design Strategies for an Alternative Nation, Decentralisation over Centralisation. You will go through the entire process of design practically in the context of a design of your choice. This is the core outcome of the course process and you will complete a full permaculture design and present it. The design will take the form of maps, pictures, text, and models. Materials for the design will be provided. Upon completion of the course, you will be provided with an internationally recognized Permaculture Design Certificate. Kent Tahir Cooper, Alex Kruger, and Guests….